The renovations at the Highland Dallas, a modern hotel in the city’s burgeoning University Crossing neighbourhood, started when James Beard-nominated chef John Tesar’s contemporary take on a classic steakhouse was re-unveiled. Designed by local firm Breckinridge/Taylor, the restaurant greets its guests with a peak into its meat locker, an effective statement that Knife is a carnivore’s playground. The eatery’s lobby is separated from the main dining room by custom metal bamboo rods, a subtle sign that this is not your typical steakhouse. 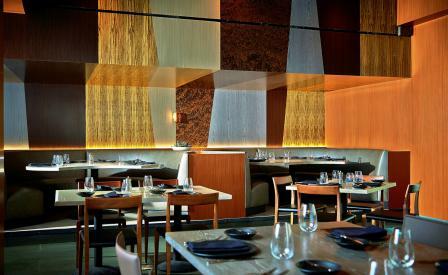 The rest of the restaurant shows off a more sophisticated design narrative that is mostly monochromatic. Warm wood dominates the space: The most impressive of which is the massive wall of mix-and-match wood inset highlighting a variety of woodgrain. This looms over semi-circle booths in muddy grey leather while vintage western-inspired chairs with cow horns provide seating elsewhere. The one burst of bold colour comes at the open kitchen, which is almost entirely covered in bright emerald tiles. Their glazed surfaces, which cover the back wall and the front counter, certainly complement the restaurant’s penchant of all shades of brown, but the dynamic juxtaposition draws the eye right to chef Tesar’s stage.